Purdue University prepares annual crop budgets. These budgets compare corn and soybean production in a variety of yield environments for the state of Indiana. The 2017 budgets show that farmers should expect negative net earnings for most cropping situations. Unfortunately this is not a new situation. The expected earnings for a corn/soybean rotation on average quality Indiana farmland is shown for each year from 1991-2017 in Figure 1. Figure 1. 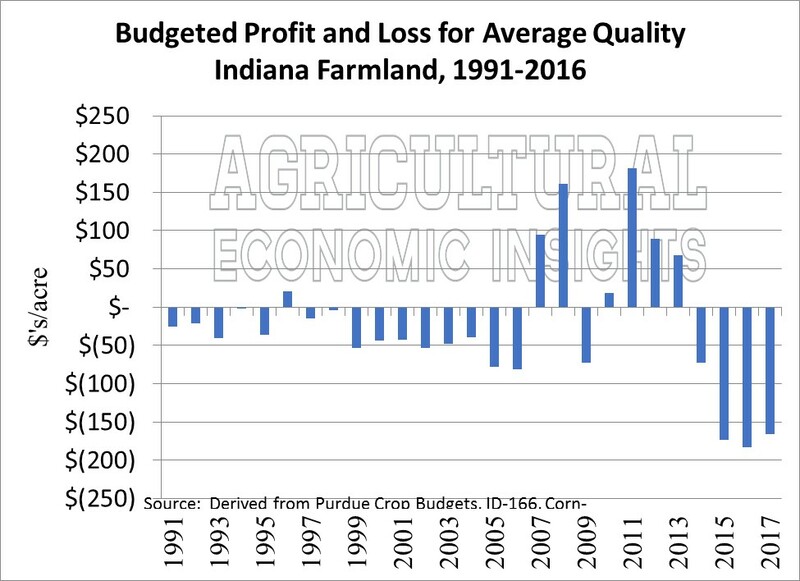 Expected Profit/Loss on Average Quality Indiana Farmland 1991-2017. The data in Figure 1 indicate that a farm with a similar situation can expect net earnings of -$166 per acre. While this is a slight improvement from 2015 and 2016, it is still a rather large expected loss. Further, this will be the fourth consecutive year of large expected losses on most farms. While some farms may have more favorable cost structures than described in the budgets, it has clearly been a tough stretch and will make 2017 a very important year. As farmers begin to make their planting decisions, one of the key factors that they will consider is which crop makes the largest contribution to their fixed costs. The contribution margin is calculated by subtracting variable costs such as fertilizer, seed, pesticides, drying costs, machinery repairs, fuel, and crop insurance from expected revenues. The budgeted contribution margins for corn and soybeans are shown in Figure 2. Figure 2. Expected Contribution Margin for Corn and Soybeans on Average Quality Indiana Farmland 2000-2017. As the graph shows, soybeans are often very competitive with corn in Eastern Corn Belt locations such as Indiana. In fact, corn contribution margins exceeded soybean contribution margins in only 8 of the 17 years shown. Most notably, corn was significantly more attractive in 2007, 2010, 2011, 2012, and 2013. In these years, corn contribution margin exceeded soybeans by a high of $87 per acre (2007) and a low of $38 (2010). From 2011-2013 the difference was a remarkably consistent $52 per acre. On the other hand, when soybeans contribution margins exceeded corn, the difference was not typically very large. Prior to 2014, the most soybeans had exceeded corn was $27 in 2006. Today, the difference is $64 per acre and is the second largest advantage for soybeans in the last 17 years. The only year with a larger budget period advantage was 2014 when the soybean advantage was $71 per acre. In general, it appears that in areas with budget conditions similar to Indiana that contribution margins strongly favor soybean production. Do Contribution Margins Matter for Planting Decisions? The obvious question that arises from the above analysis is whether there is a relationship between the level of contribution margins and planted acres of these crops. To look at the relationship between planting decisions and expected contribution margin we calculated the ratio of corn to soybean contribution margin, the ratio of corn plantings to soybean plantings at the national level, and the ratio of Indiana corn to soybean plantings. These relationships are shown in Figure 3. The red line shows the ratio budgeted corn to soybean contribution margin. This ratio is just another way of presenting the data in Figure 2. When the red line exceeds 1, it means that corn has a higher contribution margin than soybeans and vice versa. One can quickly spot corn’s large advantage in 2007 when its contribution margin was 1.34, or 134% of soybeans. Likewise, the significant advantage of soybeans in recent years is seen by the ratio falling to its current level of 0.74, indicating that the 2017 corn contribution margin is 74% of soybeans. Figure 3. Ratios of Corn to Soybean Contribution Margin, National Plantings, and Indiana Plantings, 2000-2017. The next lines to consider are the ratios of planted corn to soybean acres. The blue line shows the national situation, while the green line shows plantings within the state of Indiana. At the national level soybean plantings have never exceeded corn plantings. The closest that they came was 2001 when corn plantings were only 2% greater than soybean plantings. However, one can see that the ratio of corn to soybean plantings is lower in Indiana than at the national level. This indicates that soybeans tend to be slightly more attractive in Indiana than at the national level. In fact, soybeans acres have exceeded corn acres 3 times (the green line falls below 1) in Hoosier state. 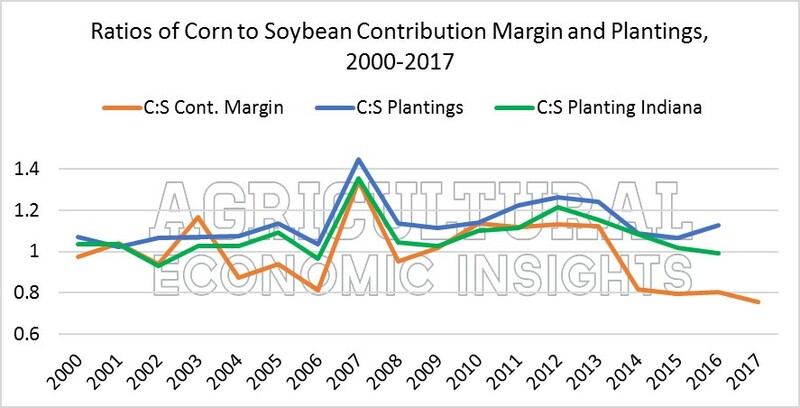 This is not surprising given the general trend of contribution margins favoring soybeans as was seen in Figure 2. However, the lowest the ratio has ever fallen was 93% in 2002 when soybean plantings exceeded corn plantings by 400,000 acres (5.4 million acres of corn versus 5.8 million acres of soybeans). The three lines also suggest that there is a relationship between plantings and contribution margins. As the ratio of corn to soybean contribution margin increases, the ratio of corn to soybean plantings tends to increase. This appears to be especially true at the extremes. For example, note that when contribution margins strongly favored corn in 2007, corn gained considerable acres relative to soybeans. Likewise as the margins have declined, corn plantings tend to fall relative to soybean plantings. For instance, national corn plantings relative to soybeans fell sharply (from 1.24 to 1.09) in 2014 when soybeans held their largest contribution margin advantage. However, the relationship is far from perfect. 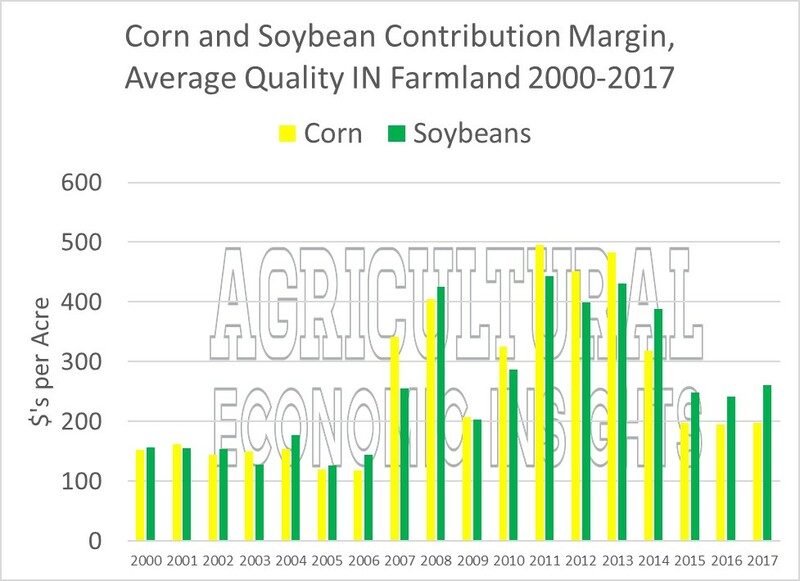 For instance, from 2010-2013 the contribution margins remained relatively constant, yet corn acres relative to soybeans increased. At present, the budgeted contribution margins for Indiana show a clear advantage for soybeans over corn. The magnitude of the advantage is the second largest in the last 17 years. While contribution margins are not perfect indicators of actual plantings, the data suggest that they often provide insights into actual planting decisions. Given the overall magnitude of the advantage, one would expect farmers with similar budget situations as those shown by Purdue budgets will be strongly consider soybeans in their rotation. However, it is also true that other factors are very important when thinking about planting decisions. One of these is the competitiveness of crops other than corn and soybeans. Part of the increase in corn acres last year came from farmers switching away from spring wheat. Additionally, the expected yields of soybeans compared to corn differs greatly throughout the country. In some areas budgets will look very different than those for Indiana. Another factor that may come into play is the working capital and financial situation on farms. Soybeans require a significantly smaller upfront investment than corn. Given the previous three years of losses, one might expect that this will play into some farmer’s thinking. Finally, one must consider how many acres can actually be planted to soybeans even when budgets favor the crop. The lowest ratio of corn to soybean plantings in Indiana was 93% and soybeans only exceeded corn plantings by 400,000 acres that year. The crop insurance price discovery period is just around the corner for much of the country. As we all know, price relationships can change very rapidly and could easily tilt the playing field either way. As we go forward, we will examine several of these issues in more detail as it is certainly set up to be one of the more interesting planting seasons in recent memory.